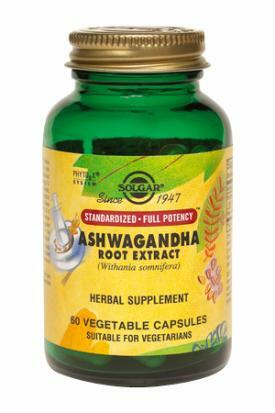 SFP Ashwagandha Root Extract Vegetable Capsules is one of Solgar's premium-quality herbal formulas. As an herbal dietary supplement for adults, take one (1) vegetable capsule up to two (2) times daily, preferably at mealtimes or as directed by a healthcare practitioner. Vegetable Cellulose, Microcrystalline Cellulose, PhytO2X Blend (L-Ascorbic acid, natural beta-carotene), Vegetable Magnesium Stearate, Water. May contain vegetable glycerin.